Wire Fox Terriers have small, elegant frames covered in dense and mostly curly white harsh and wiry coats with black or tan patches. They have broad, flat heads with long, full muzzles. Their V-shaped ears usually bend forward, and their intense eyes are set slightly apart. They have long, muscular necks that slope down to deep chests and short backs. Their tails, sometimes docked, are carried high. 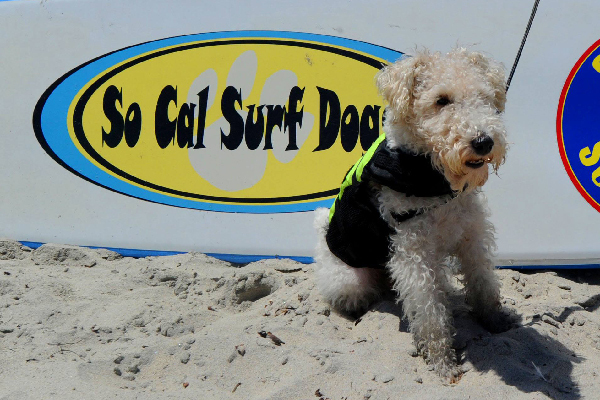 Overall, the Wire Fox Terrier has a rugged but distinguished look. Thumbnail: Photography by LeeMcTaggart / Delayre Kennels. Wire Fox Terriers are high-energy dogs. Photography by LeeMcTaggart / Delayre Kennels. Wire Fox Terriers are high-energy dogs with loads of personality. They love to spend their days bouncing around the yard, wrestling on the carpet and exploring the neighborhood. Full of love and spirit, they form incredibly strong bonds with their families. 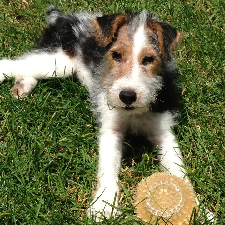 Wire Fox Terriers want to be involved in every birthday party, movie night and backyard barbecue. The Wire Fox Terrier’s strong family bonds, combined with its natural courage, make it an excellent watchdog. Their loyalty knows no bounds, and they have a resounding bark. The legend of the Fox Terrier is packed with stories of rescue and bravery, from rescuing children to fending off dangerous animals. Wire Fox Terriers are extremely energetic, not to mention curious and intelligent. They need vigorous exercise and “tasks” to maintain a stable mind and body. Take them jogging, walking and running any time of day. If you’re a hiker, they make excellent exploring companions: No matter where you go, they will always be concerned about your safety. Bring a Fox Terrier home and treat it well, and you’ve got a friend for life. Though small, Wire Fox Terriers have real chutzpah. They need firm but positive training from an early age to ensure proper socialization. With a steady, guiding hand to show them the way, Fox Terriers will get along very well with new people and other animals. Bold and fearless, Fox Terriers may confront larger dogs. Also, being natural hunters, they have the tendency to chase birds and squirrels. Always keep them on a leash for their own protection and, if possible, allow them to occasionally run free in a controlled environment. A healthy Wire Fox Terrier can live as long as 15 years. Generally healthy, this breed can sometimes develop cataracts and skin allergies. Wire Fox Terriers are fairly easy to groom, needing only the occasional brushing. They should be professionally trimmed several times a year, but they shed very little. One of the oldest English terrier breeds, Wire Fox Terriers were developed in the 1800s to drive foxes out of their dens once the Hounds had chased them in. For almost a century, Wire Fox Terriers and Smooth Fox Terriers were categorized as the same breed. However, they have very different origins: The Smooth Fox Terrier derived from the working terriers of Wales and Durham, while the coarse-coated Wire Fox Terrier — bred for rougher terrain — has Beagle and Greyhound in its family tree. Official standards for each breed were established in 1984.